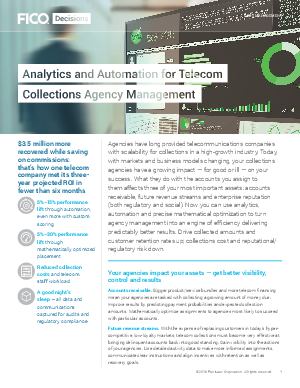 Agencies have long provided telecommunications companies with scalability for collections in a high-growth industry. Today, with markets and business models changing, your collections agencies have a growing impact — for good or ill — on your success. What they do with the accounts you assign to them affects three of your most important assets: accounts receivable, future revenue streams and enterprise reputation (both regulatory and social). Now you can use analytics, automation and precise mathematical optimization to turn agency management into an engine of efficiency delivering predictably better results. Drive collected amounts and customer retention rates up; collections cost and reputational/ regulatory risk down.